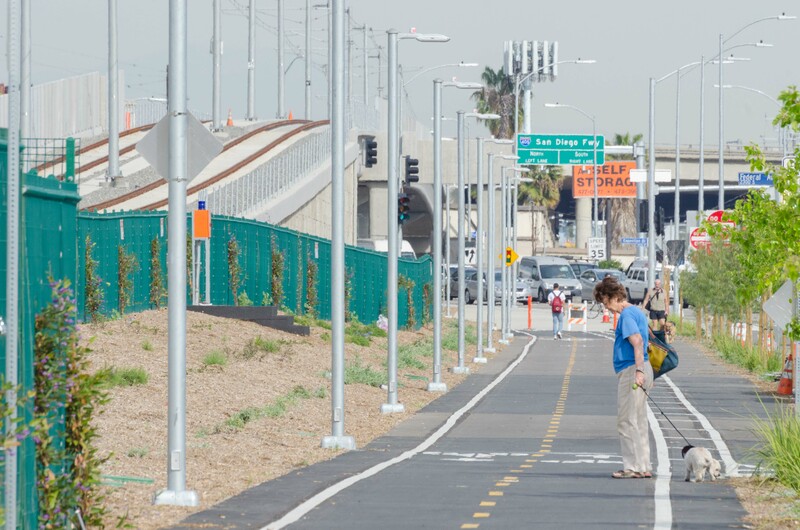 The new walk/bike path along the second phase of the Expo Line in West Los Angeles. Photo by Steve Hymon/Metro. Metro has released a draft Active Transportation Strategic Plan that explains how the agency plans to help cities encourage more walking and biking around Los Angeles County. In plain English, this is Metro’s attempt to make it easier to walk and bike to transit stations — where there’s only so much room for parking — and to help cities fund and build regional walk/bike paths that connect communities. This is kind of weird in that it’s the cities, not Metro, which have the authority to determine the character of their streets. Aside from offering grants to jurisdictions that are already interested in complete streets and making its station areas conducive to walking and biking, it’s tough for me to see what Metro can do. It’s kind of like how Metro has no authority to promote transit-supporting land use patterns (e.g. higher densities, mixed land uses), even though that would be very useful from the perspective of promoting the use of transit. By the way, I love the bike rails that make it easy to take your bike up and down stairs at the El Monte station. Great idea! A thoughtful document (case studies), if a plan like this can be implemented across the county it would go a long way to improving use of transit, and citizen quality of life. Wouldn’t be better for both Metro and passengers to have better connecting bus service to Metrorail stations? Not everyone lives in flat land where they can use bikes or walk. Some areas have very little if any bus service at all. Also, it is difficult for people to go grocery shopping by walking or biking with heavy bags. This might be good for young people, but once you get older, it is different. In addition, most cities run the most unreliable bus service for disabled people I once used a senior cab service after surgery when I went for a doctor’s appt. The cab service has the most discourteous, rude drivers imaginable. When they came to pick me up at the doctor’s office the dispatcher sent them to an address in a different city. Is there a way to tell which specific streets are in the plan? You made the lines very thick so that it is difficult to tell which streets are being recommended in some areas. Specifically, which streets in Pasadena and South Pasadena are in the plan?